Hello and happy Sunday! 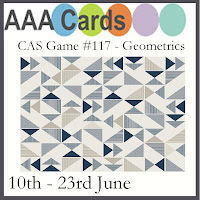 My card today is for the AAA cards challenge #117. The challenge is CAS Geometrics. I have stamped the beautiful Kaleidoscope Background Stamps from Catherine Pooler Designs in black versafine ink and heat embossed with clear sparkle embossing powder. Then I cut it into three strips so I can make three cards! The butterfly is from Happy Little Stampers Butterfly Birthday and I stamped it in black versafine and clear heat embossed it. Then I coloured it in with Catherine Pooler Inks and a blender pen. While I was at it, I made a pink one too and I added some Pink Lemonade sequins to the wings from Brittney Lee! There is a geometric challenge over at StampNation so if you're a member you will see my cards over there too. Such a delicate and eye catching background stamp. Love that you trimmed it down to maximise its use and keep your card beautifully CAS. Thanks for playing at AAA Cards. Great way to use that background stamp; it really makes the butterfly pop.